In 1961 Los Angeles, children's author P.L. Travers arrives at the Walt Disney Studio to negotiate selling the rights to her novel Mary Poppins to its titular studio founder and producer. Disney has been pursuing the movie rights for 20 years. Travers does not want to sell them. 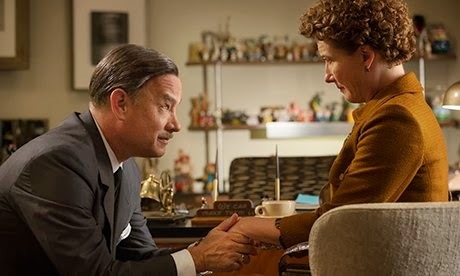 Of course in Saving Mr Banks, directed by John Lee Hancock and starring Emma Thompson and Tom Hanks, the result of this battle of wits is a bit of a foregone conclusion: we all know that Walt Disney Pictures released Mary Poppins in 1964 to enormous critical and commercial success. Thankfully Saving Mr Banks has more than enough additional elements in it to be one of the most entertaining films I've seen in quite a while. The film is centred on Emma Thompson's wonderfully spiky performance as Pamela Travers: sharp, blunt and almost perpetually irritated by the world around her. If it wasn't for a cleverly placed recording of the real Travers during the closing credits you would be forgiven for thinking she's playing a caricature. The character is a delight, and the film's extensive flashbacks to her childhood ensure that she has a depth and backstory to explain why she acts the way that she does. Thompson is supported by an outstanding cast of actors, including the aforementioned Tom Hanks (who manages to give a wonderfully accurate sense of Walt Disney's public persona despite looking nothing like the man). Also great is Paul Giamatti, who plays the only role that isn't based on a real person, but provides a valuable humanising effect on Travers. I liked her, because I liked him, and he liked her. Bradley Whitford, Kathy Baker and Jason Schwartzmann are all wonderful. Colin Farrell plays Travers' father in the flashbacks; it's one of the best performances that I've seen him give. I've always been fascinated by Farrell, who's an immensely talented actor that should be doing more finely crafted roles likes this instead of leading man parts in bad science fiction and action movies. There have been accusations that Saving Mr Banks does the real Pamela Travers a disservice, by implying that she liked the film of Mary Poppins. I found it to be portrayed much more ambivalently. The film certainly has a cathartic effect, but as she states herself: 'I hate cartoons!' It's also important to remember that this is a dramatic film based on actual events, and not a documentary. A ten year-old child could work that out, but apparently you can't if you're a complete moron. Or Harlan Ellison. In fact if the film does anybody a disservice, it's Disney screenwriter Don DaGradi (played by Bradley Whitford) and particularly his co-writer Bill Walsh. One of the most nuanced and impressive aspects of Mary Poppins the movie is that Poppins does not come to Cherry Tree Lane to help the Banks children at all: she's there to teach Mr Banks to pay more attention to his children, and to appreciate the important things in his life. Together DaGradi and Walsh took a charming but outdated children's novel and turned it into something with subtext and heart. Saving Mr Banks tells us that this was Travers' idea all along, thus taking away what was perhaps DaGradi and Walsh's finest achievement. This is a film made by its performances, and despite any flaws in accuracy or fidelity to the truth is one of the most entertaining dramas I've seen in ages.